“You have to ‘Feel’ it” is an old saying of mine that means knowing how to do an important, complex skill in the mountains is not enough; the skill has to be an extension of your self-image. You have to “Feel” the capability provided by the skill as you do an arm or leg. And you have to be able to use the skill without thinking, just like you can walk or run without thinking about what you are doing with your hands & feet. When you have to concentrate on the details of performing the skill, you attention is unavailable to other important considerations, such as where you are going and hazards in the way. The “yield and overcome” mindset is a skill that will help us to enjoy safe success atop the high peaks. To use it, we need to become competent in performing the mindset and we need to push that capability into our unconscious so we can do it without thinking. We need to be competent so that we can maximize our enjoyment and success in our high peak adventures. We need to push it into our unconscious because we need our conscious, active thinking powers for route finding, weather monitoring and other urgent tasks. If we cannot perform the “yield and overcome” mindset without thinking, it will be crowded out of our narrow attention. We have to “Feel it” to use it. Neither you nor I can acquire a new skill just by reading a book. Simply memorizing a list of required steps does not allow us to perform a skill sufficiently well. Reading a book stimulates our intellect, allowing us to store information and perform critical thinking about the ideas being presented. A book may even simulate our emotions, as we may react to the ideas presented with an impact on our feelings and beliefs. But to fully acquire a new skill, we need to involve all parts of our whole body, the physical, emotional and intellectual aspects. Unfortunately, we rarely get to follow these stages in sequence, mastering one stage for the entire skill set before moving on to the next stage. 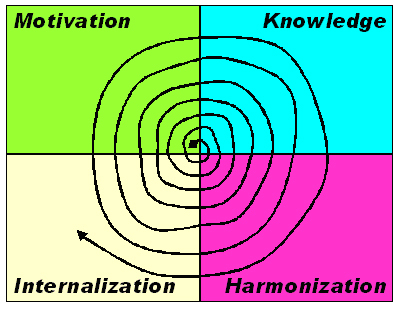 Rather the pattern is more like a spiral as we move around the cycle of being motivated to improve, acquiring knowledge of the skills, harmonizing our whole body ability to perform the skill, and internalize the skill into our unconscious. We typically start with a kernel of skill knowledge and add on layers to develop a deep, mastery of skill that we can perform without thought, with the occasionally bad habit needing to be unlearned along the way. 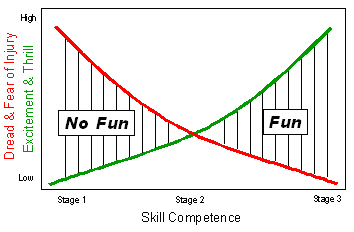 For example, below I have described my own experience learning to ski as an adult. This description shows that I did follow the stages with a considerable degree of spiraling toward competence. 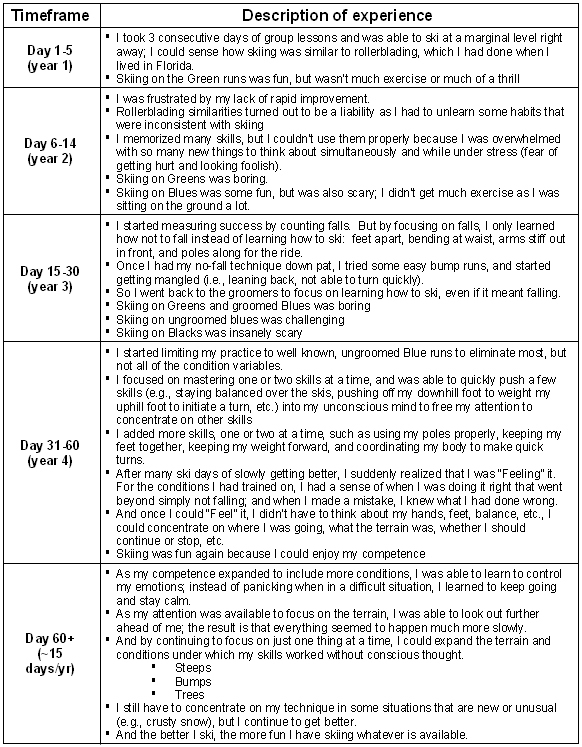 Some of this experience is a result of my own stubbornness and ego, but is also a function of the difficulty of internalizing a complex skill in an unsafe, emotional environment without complete & timely feedback. Perhaps it is similar to your own experience. This will be the way to know, harmonize, and internalize the “yield and overcome” mindset as well. Through practice and learning from experience, and by enjoying the whole process, we will first become good at performing the mindset and eventually be able to “Feel” it. And that will make all the difference. People have reasonable concerns about adventuring atop the high peaks. Mountains are beautiful at a distance and in photos, but they are quite clearly very big and unforgiving up close. But there is also the novelty of something new and bold, and the prospect of accomplishing hard goals and being the kind of person we always wanted to be. If the novelty wears off before we are competent, mountain adventures will start to feel like dangerous work for little pay. If we can become competent, we’ll be able to find additional motivation in fun to push on with our mastery of the “yield and overcome” mindset. Fortunately, our bandwidth concerns are primarily for our “foreground” or conscious processing needs, what we generally refer to as our “attention.” The bulk of our mind’s activities are for the “background” processing of our autonomic and unconscious processing needs (perhaps this is where the “we only use 10% of our brains” myth comes from). This presents two opportunities: (1) get more skills being processed in the background to access more bandwidth, and (2) get skills to feel like instinct and be available in the presence of strong emotions and urgent situations, when those skills are not dependent on our limited attention bandwidth. We need to push the “yield and overcome” mindset into our unconscious because we need to keep our conscious, active thinking powers available for route finding, weather monitoring and other urgent tasks. If we cannot perform the “yield and overcome” mindset without thinking, it will be crowded out of our narrow attention. We have to “Feel it” to use it. In order for us to adopt the “yield and overcome” mindset, we must go about an effort to understand it, then learn to use it properly, and then use it consistently and frequently until, finally, it becomes automatic. Just as skiing is a skill that is really a set of skills, a mindset is a set of skills that involve the whole body in enjoying, surviving and achieving atop the high peaks. The “yield and overcome” mindset is a conscious and unconscious readiness to act, feel and understand situations atop the high peaks. We enjoy the physical, emotional, and intellectual process of adventuring and the resulting success atop the high peaks. We enjoy the feeling of our body & mind working together to overcome obstacles. We are prepared to expend effort to plan for our adventures, execute those plans for safe success, responsibly deal with the issues that inevitably arise, and learn from the experience by reviewing the results of each trip, trip after trip, year after year. Keep a journal to express your thoughts and to record your learnings. Remind yourself at any time that you should enjoy the trip and destination; be happy. The “yield and overcome” mindset is a conscious and reflexive readiness to act, feel and understand situations atop the high peaks. We enjoy the trip and the destination, and we enjoy the challenge and feeling of our body & mind working together to overcome obstacles. We are prepared to expend effort to plan for our adventures, execute those plans for safe success, and responsibly deal with the issues that inevitable arise, trip after trip, year after year. It may sound strange, but the “yield and overcome” mindset will become an extension of your self-image…one that may make a big difference that goes beyond a thousand days atop the high peaks. You can do whatever you want; so choose to enjoy life. You won’t even have to think about how.